This YouTube live-stream video is being broadcast using 1080p HD security cameras connected to a video surveillance DVR from CCTV Camera Pros. This YouTube livestream video is being broadcast using 1080p HD security cameras connected to a video surveillance DVR. The HDMI output of the DVR is set to a spot monitor mode, which automatically switches the screen between the single and multiple camera views. This is how it's set up. Up top, we have 16 cameras hardwired to our DVR. These are a mix of different types of HD over coax type cameras, also referred to as HD CCTV cameras. These are 1080p AHD and 1080p HD-TVI cameras. So RG59 Siamese coax cable is used to hardwire those 16 cameras back to the DVR. In this particular case we're using the HDMI output of the DVR to connect to our streaming PC. Our streaming PC is a Windows PC with a video capture device installed. It's an HDMI video capture card from Blackmagic, and we're using Open Broadcaster Software. That PC is connected to a high- speed internet connection via our router and cable modem, and that's what allows us to connect to the YouTube streaming server. So the result is the live video that you see here, and again, our DVR, the HDMI output is set to a spot monitor mode, which basically allows the HDMI output to continuously display these different live camera views, and it doesn't impact the operation of the DVR. We have another monitor set up using the VGA output, and that allows us to control the DVR to search through and play back recordings, and that doesn't impact this HDMI output at all. That's what a spot monitor is. Here is how the monitor is set up on the DVR. So on the DVR, if I go into the menu system and then go into the display settings, on this screen, that spot dwell, this is where I can set the number of seconds that the spot monitor pauses on each view. So it's when scrolling to, from view to view, that's the amount of time it'll pause, and you can either have these DVRs set up in a dual display mode where both the VGA and HDMI are the same, or the mode that we're switching to, which is a spot monitor. That allows you to go in here and configure different types of live views. So I'm just gonna set up a couple of different screens. I'll set up some single camera views first. Camera one, just added camera two. Add a couple more, I'll add cameras three and four, and these are all single camera views. It's going to pause on each of those views for five seconds. You can also set up multiple camera views. So we'll set up a four camera view, and you can choose which cameras appear in that grid. We'll do cameras one through four, I'm also going to set up a nine camera view and we'll set up a view that displays all 16 cameras. So once all those views are set up, I can close out of this screen, and then apply these settings. So again, the VGA monitor's going to be the main monitor, and the HDMI's going to be the spot monitor that we use for streaming, and then when I save that configuration, the DVR will need to reboot. So then the result is, here we're back to the live stream, and this is the HDMI output. Again, connected to a streaming PC, and here's the single camera views that I set up. So that's cameras one through four in single camera mode. That one happens to be a PTZ camera, so it moves to different locations. You can also control it. And then here's our four camera view, and then you'll see the nine and 16 multi-camera views. So if you're just joining us, this is a YouTube live stream video that's being broadcast using 1080p HD security cameras connected to an Eye DVR Pro video surveillance DVR. We're using the HDMI output of the DVR in spot monitor mode which automatically switches the screen between these single and multiple camera views. Here's basically the network layout of how this is configured. So we have 16 HD CCTV cameras connected to our Eye DVR Pro, and these DVRs are compatible with the old analog CCTV cameras, standard definition, as well as the latest HD over coax cameras, AHD, HD TV-i and HD CVI high definition format are also ported. Those cameras are hardwired to the DVR using RG59 Siamese coax cable, and then using the HDMI output the DVR, we're connected to a streaming PC. 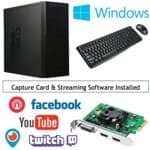 We build streaming PCs here at CCTV Camera Pros with Blackmagic capture cards, so we're using a 4K Blackmagic capture card in this particular PC, and then capturing the HDMI output of the DVR. You'll notice I also have that diagram, RTSP stream. You can also directly access the RTSP stream of each of these cameras on the open broadcast software on the streaming PC, but what I found is the HDMI output is much faster, there's no lag at all, and the fact that you can set it to this spot monitor mode like this, that just rotates to different camera views that you can configure, it's really convenient, especially if you want to kind of automate some live broadcasting. And again, back to this screen. So the network router there is connected to a high-speed internet connection. We use a cable connection here at the office, and then this is what enables that streaming PC to communicate with the YouTube Live stream server, Facebook Live, or Twitch TV. You can broadcast to all these different live streaming networks as well as many others, and I'm going to go over just one more time how the spot monitor is set up on the Eye DVR Pro. So I access the DVR's menu system. We're now viewing the DVR directly, and then in this display setting screen, I can configure how many seconds delay or pause at each of the screens we configure, that it stays on each of those screens. So we're just going to set it to five seconds, and then the duplicate screen display, we switch that to a main monitor plus spot. That enables the HDMI output to always display these different live screen views, even if the administrator's on the DVR, on the VGA monitor, that won't impact the spot monitor display. So the way I have it set up is I add cameras one, two, three and four as single camera views right here. And then I'm going to add a four camera view for cameras one through four. You can select any of the 16 cameras to go in this view, and of course you can have multiple four camera views as well, that scroll from one four camera view to the next. We're just going to keep the one four camera view and then add nine and 16 camera multi-views. And then on the DVR, when you close and save that, the DVR will need to reboot. So we apply the settings, and then just acknowledge that the DVR is going to reboot. And again, the result is these live camera views that scroll from one view to the next. These are the single camera views that we configured. And then you can see the four camera view here. And the nine camera view, and then last, the single camera view. You'll notice camera three is a pan-tilt- zoom camera. That's set on automatic tour to go to, I think like, 16 different preset locations. We're back now on the single camera view, so you'll see the PTZ camera again here in a second. There it is. So here again is how this is all set up. There will be a URL on the YouTube video page with a link to our live streaming webpage that you can read about how this is done. I'm going to also post this on our website. If you want to learn more about live streaming using HD security cameras and DVRs, you can actually also use multiplexers if you don't want to use a DVR, we have equipment that'll let you use your existing DVR and split the existing video signal from each of your cameras out to a device that can switch to these different camera views. If you want to learn more, visit www.cctvcamerapros.com/LiveStream. Thank you for watching. 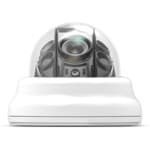 Click here to learn more about the HD Security Cameras used in this video.